Most the houses today are hyped up with wooden flooring and finishes. This is because of their natural yet classy warm look and finish. Many homeowners would also consider wooden floors as nature filled space, giving the entire house a cool and relaxing atmosphere. Moreover, a wooden floor not only fulfills the aesthetic side of the design, but it is also gives more of the upsides compared to ceramic and marbled flooring. One of these advantages is the fewer worries on breakages, cracks and scratches, since wood is known to be more resistant when it comes to falling objects. They also have a beauty that lasts for ages and even versatility in any design innovations. 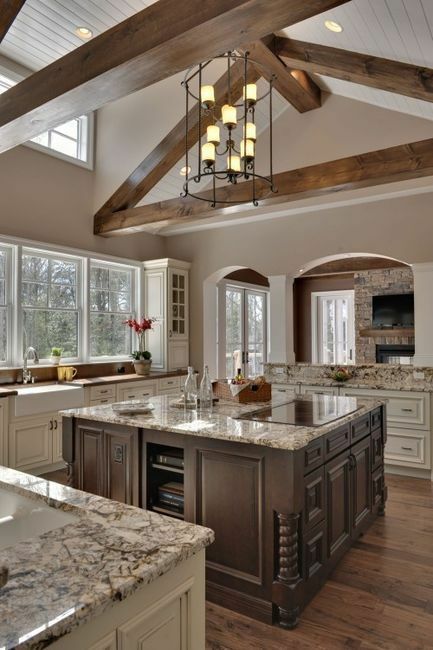 You will see several types of wooden floor designs in either a modern or a traditional house decor and one of the valued spot in the house is the kitchen. Given the multi-functionality of this space, it does literally help in the provision of the energy and food everyone needs for a day. Hence, delicate details are as much as possible being provided in the floor design for a comfortable and inspiring ambience. So, 20 of the most stunning wooden kitchen floor designs are uploaded here for your own inspiration. Enjoy! 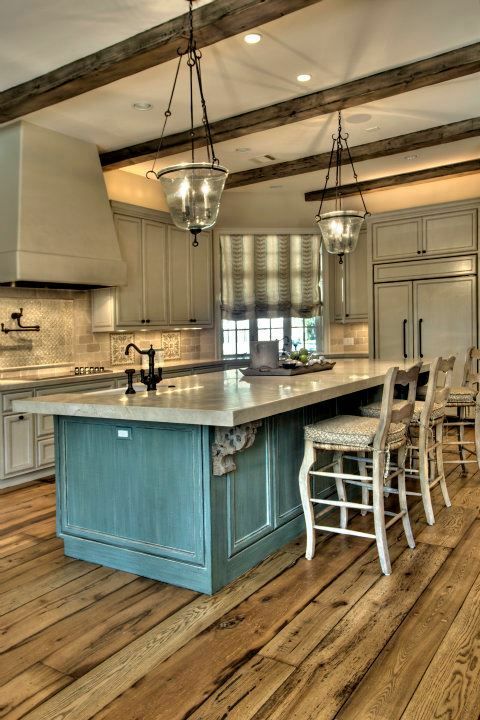 It appears that no matter how many years would pass by, wooden floors would always remain trendy and fab. The natural wood markings and linings are always as beautiful as new. The delicate details on the wood vanities as seen on the cabinets’ panel moldings, are quite matching with the wooden floor’s natural finish. It balances the extra details giving a plain and simple surface. 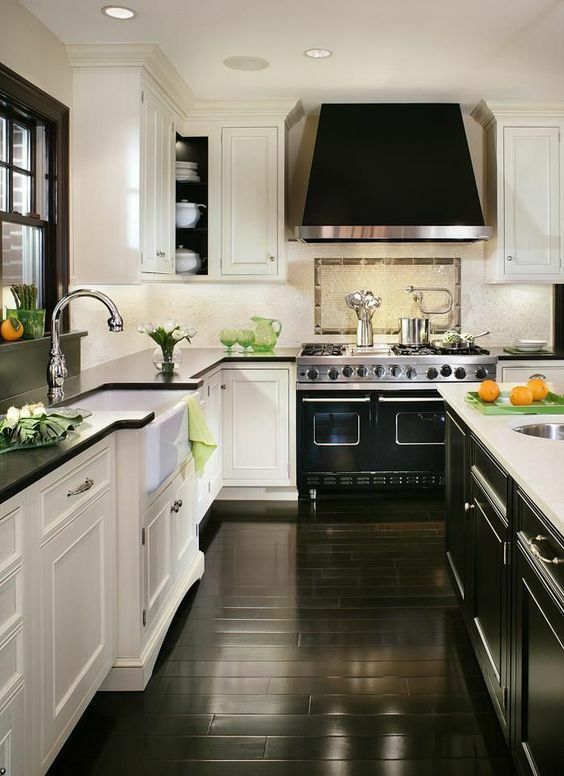 This is a traditional contemporary kitchen design with trivial panel moldings and darker wooden floor finish. 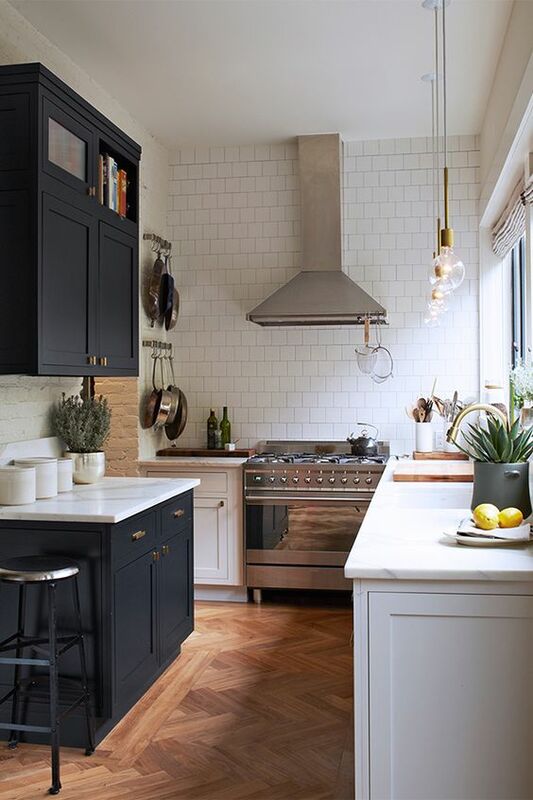 The dark tone indeed blends in with the black and white theme of the kitchen. 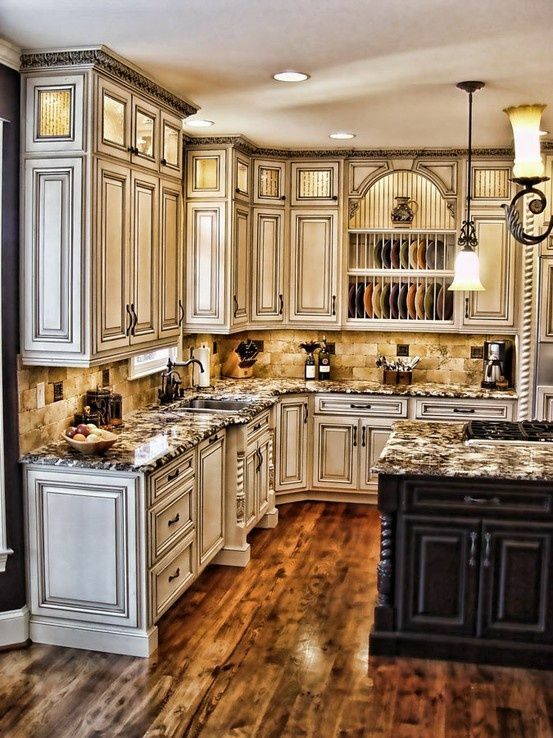 The minimalistic features of modern design are combined in this traditional kitchen design. 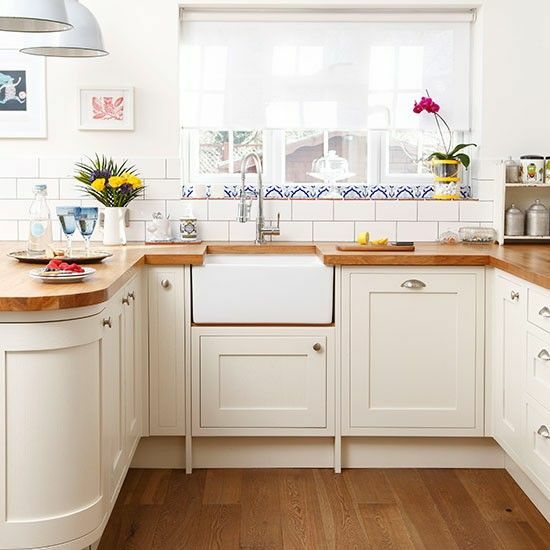 The effects of the wooden floor’s glossy finish is suitably stunning on this modern- traditional kitchen. 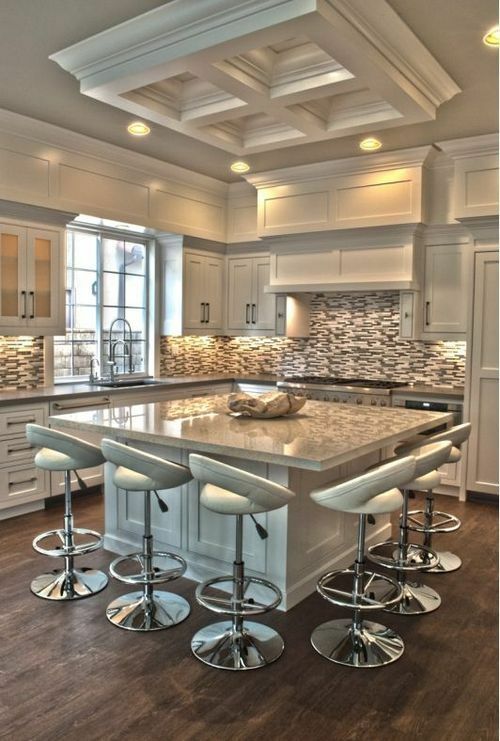 Some of the surfaces on the countertops and kitchen furniture are lustrous, so it is safe to add up a matte finish wooden floor to balance the look of this kitchen. 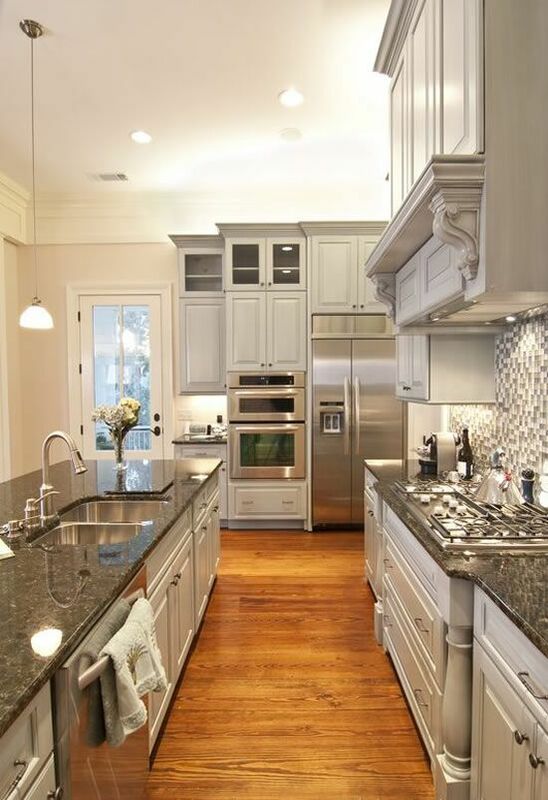 As you can see, shades of white and grey are present in this kitchen. It is good to see a floor with a natural wood finish giving the space a nice contrast. 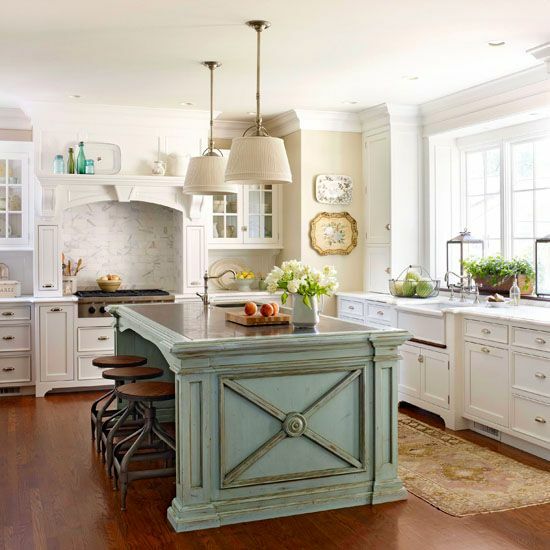 This is a traditional kitchen designed with wood vanities, and the floor seem to give itself a nice standout with its natural wood finish. It does gives a nice contrast to an all-white theme. 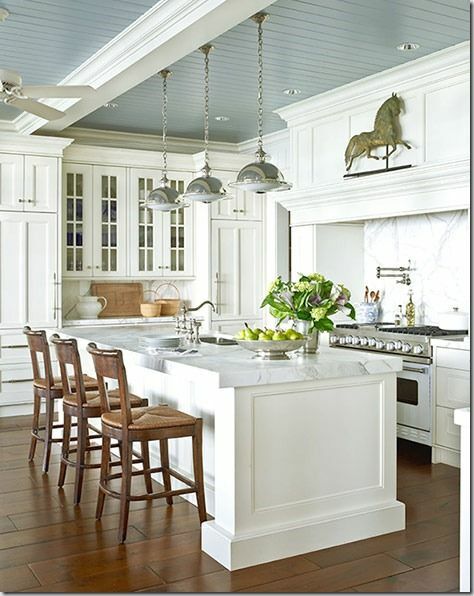 Dark wooden floor also goes very well with blue kitchen interior. No wonder the floor in this cabin kitchen made of wood as this is cabin is literally made all out of wood, starting from the ceiling down to the floor. The exposed beams on the ceiling have the rough and rustic look, while the floor contrast with a glossy and seamless wooden finish. The contrast of the texture of both comes out beautifully though. The usual patterns of wooden floors are plain and simple. Some come in seamless surface, while some come in straight lines, but this one appears different with it herringbone pattern design. Most of the countertops are made of marble and granite, but in this kitchen the countertops are matched with the wooden floor and it appears uniformly beautiful and balanced. 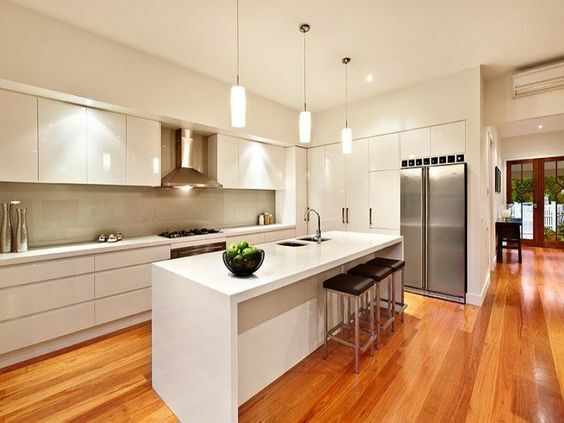 This kitchen is no doubt super minimalistic and modern. The only contrasting tone it has, is the natural color of the wood on the floor. The wood plank flooring in this modern kitchen has a rather glossy finish, and it is quite suiting and comforting for the eyes. 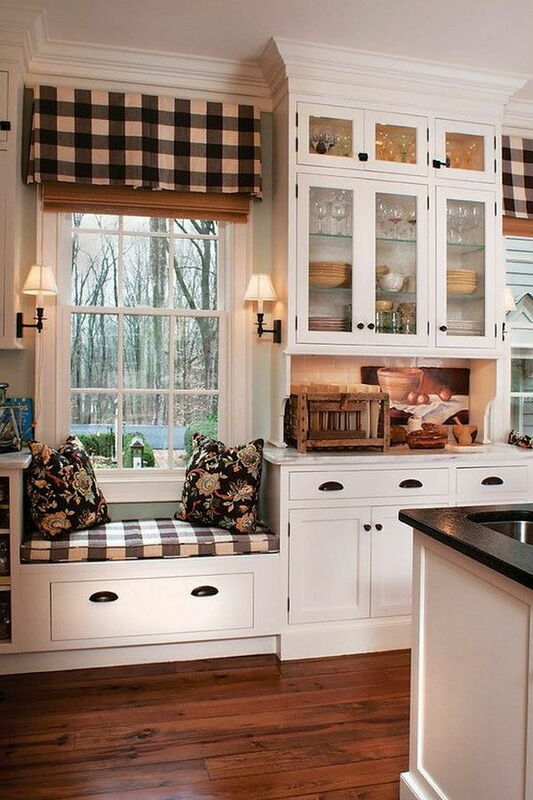 It is more of a clutter free kitchen. 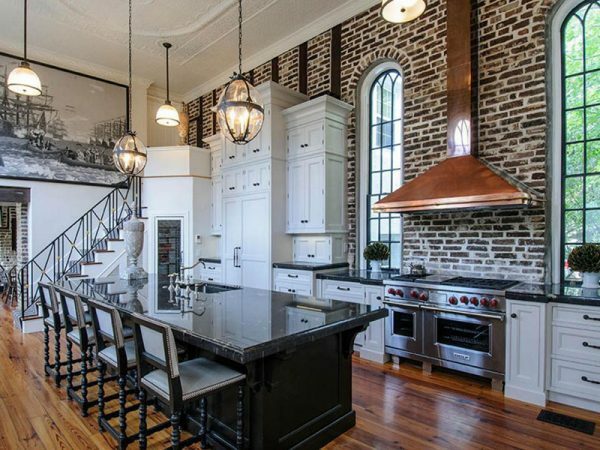 Isn’t it stunning to see a shiny wooden floor in a yet rustic and industrial looking kitchen? It gives the space a very clean and cool look. 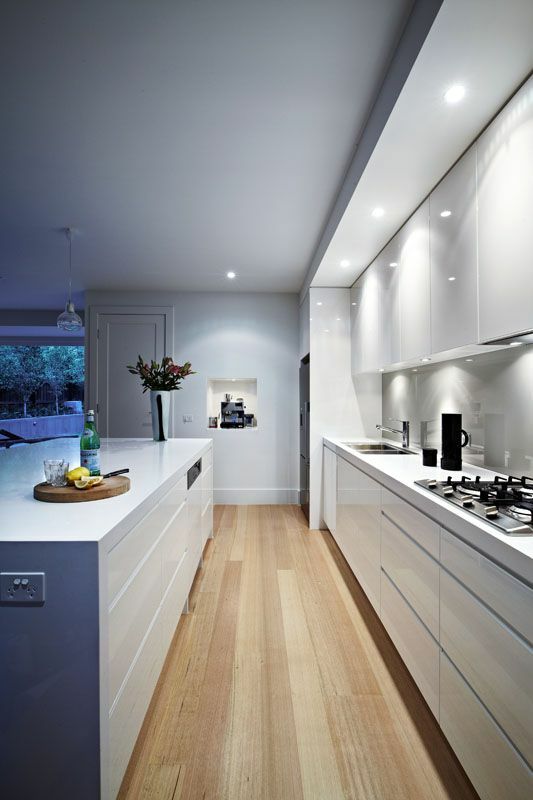 Given this fancy all-white kitchen, it is always best to add a contrasting color to give some volume to the space. The thinner wood planks give it a nice spread to the floor. 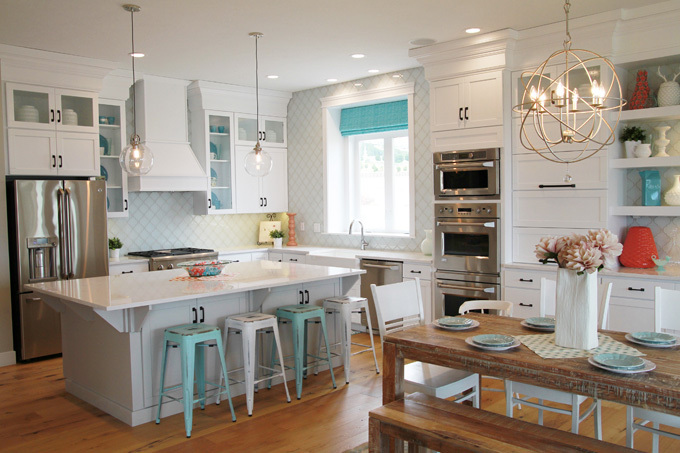 Almost everything in this kitchen is coated in white. The wood vanities are white as well as the ceiling. Good thing the floor and the dining set are made of woods. There are bold patterns present in the curtains and in the throw pillows. These match with the nice wooden floor while the other kitchen vanities are coated in white. 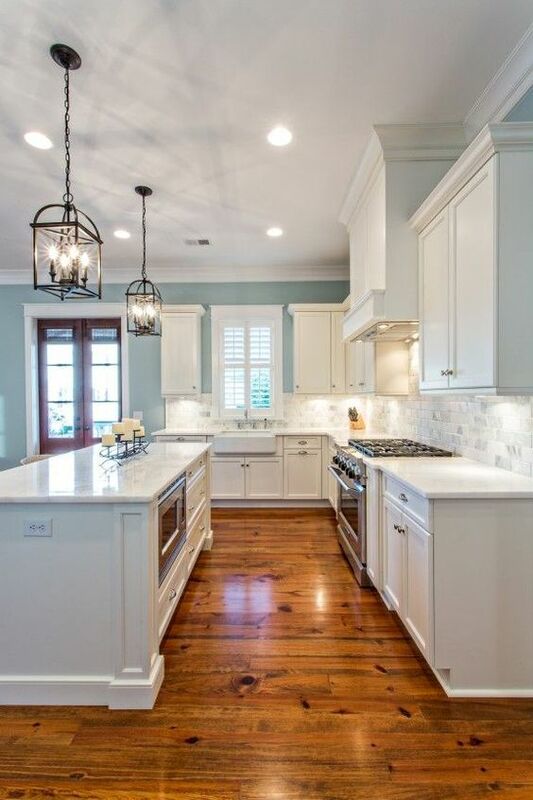 This is no doubt an all-white kitchen with a few metallic touches on the kitchen appliances and lamps, but the true eye catcher here is the wooden floor. 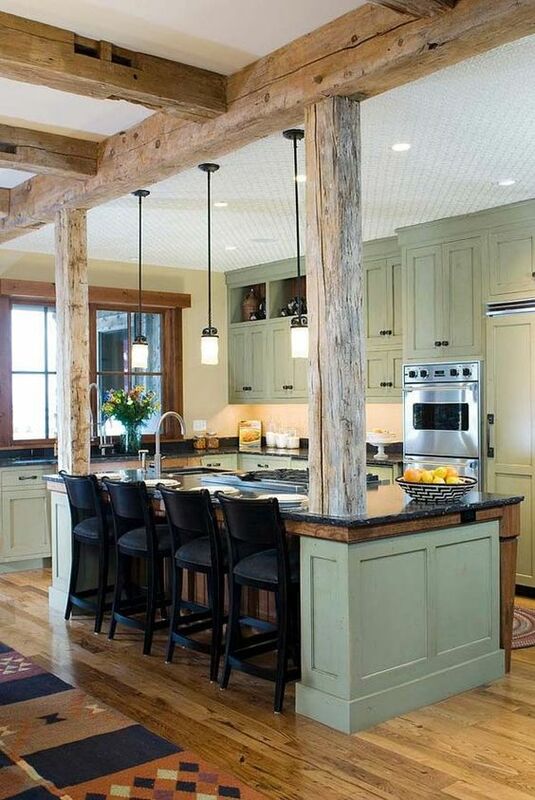 The working kitchen table is made of hardwood with a granite counter top. Not to mention the exposed beams on the cathedral ceiling and the seamless wooden floor. Some of the vanities found in this kitchen may somehow look old and shabby, but look at how glossy is the wooden floor. 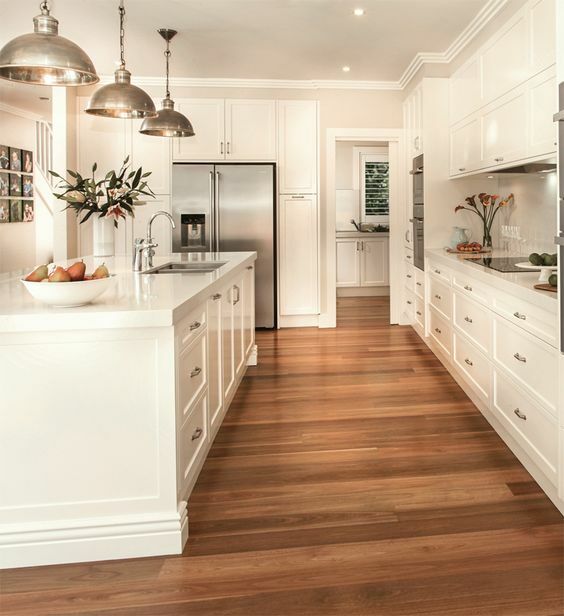 This shows that wooden floors can always upgrade the interior design of every kitchen.